On one side, designer Svetlana Tryaskina created a sculptural treatment by drawing branches on the white wall, which a tradesman traced with plaster. Plaster flowers were then added and the treatment was painted white, creating subtle shadows. 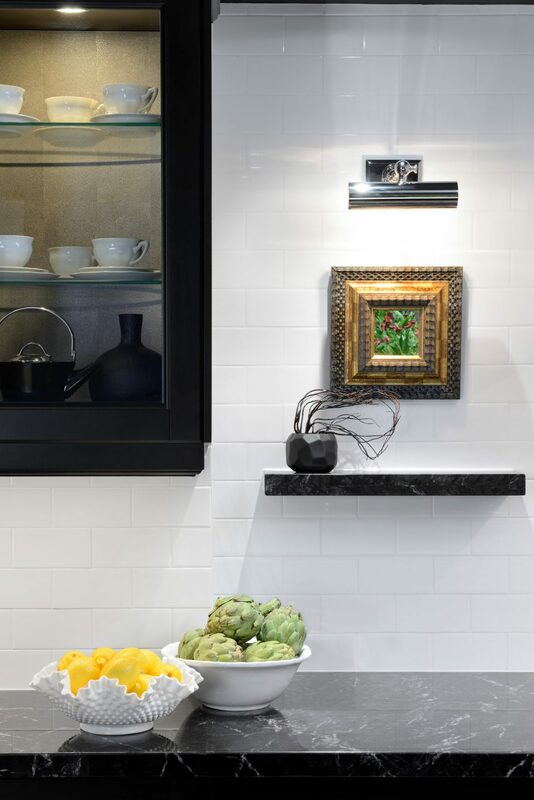 On the opposing wall, she had custom-built black shelves installed. The lower drawers are covered with a faux shagreen skin, to add texture and interest. 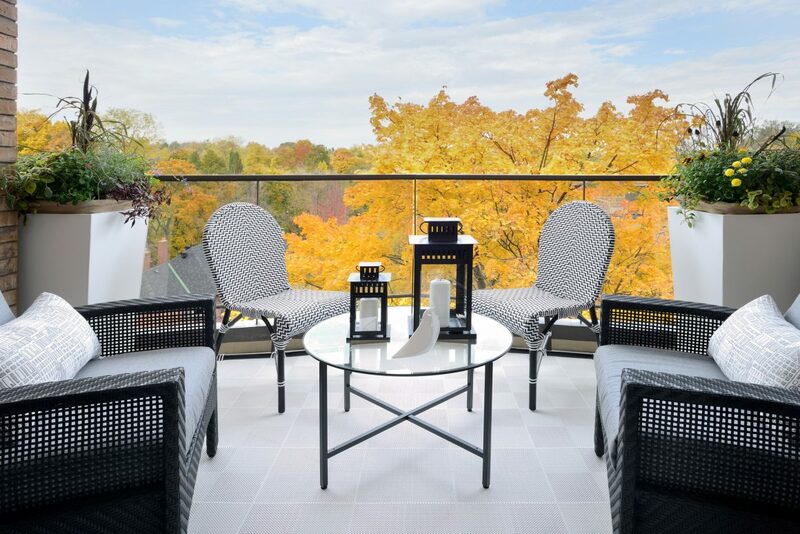 It was the perfect condo in the Forest Hill area of Toronto, according to designer Svetlana Tryaskina and her husband. They bought it. 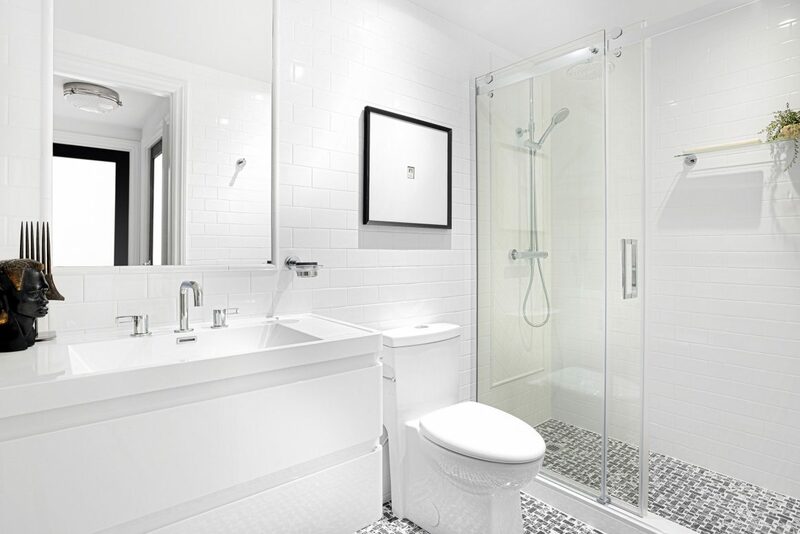 Then, she completely redesigned the interior in a way that she had always wanted. This was going to be their home. She was not working for a client, attempting to cater to their tastes. She was designing for herself. She was bold and brash with her approach. And that, it turned out, was the problem. Before they had a chance to move in, the couple got an offer they simply could not refuse. The look of the condo made its value soar. The painted concrete walls “were in extremely bad shape.” They were rough and bumpy. The unit, which had between 1,300 and 1,400 square feet was not too large. She had to maximize every inch. “We bought it to renovate,” Tryaskina says, but as the work was wrapping up, the interiors captured the attention of buyers, who offered to purchase it. They wanted it for themselves – the exact space, with the exact decor, right down to every piece of art. 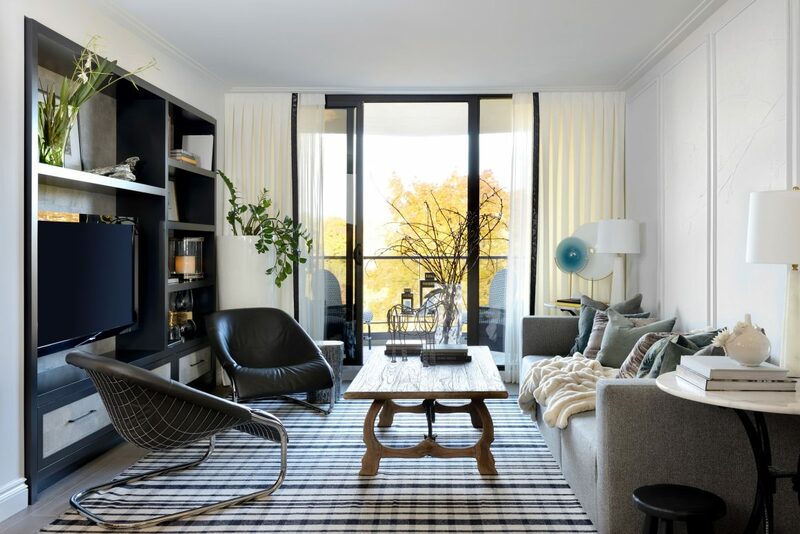 “It was a difficult decision,” says Tryaskina, the owner and principal designer of Estee Design, about the couple’s move to sell the condo. But the drama that she had created was spell-binding. 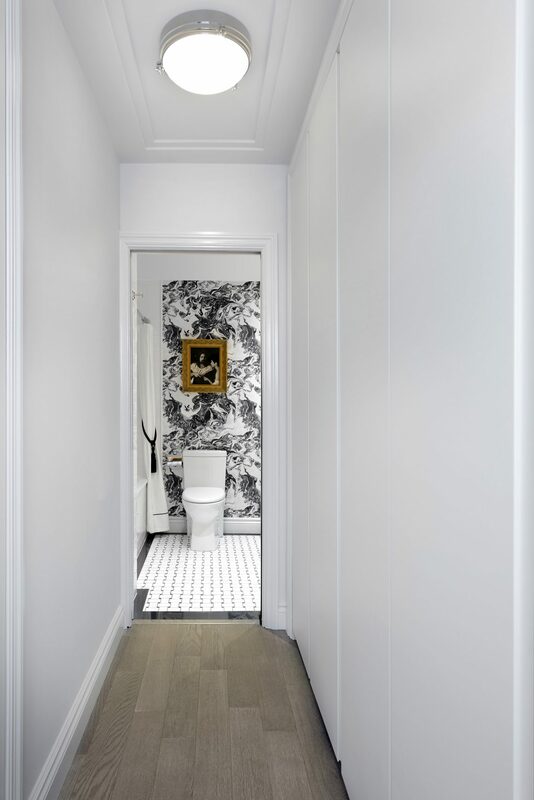 A mural featuring a portion of Dutch artist Johannes Vermeer’s masterpiece known as The Girl With A Pearl Earring dominates the black panelled wall, making a dramatic statement. The result is a daring and dramatic look that holds a few surprises. “I just liked the contrast. I liked the sharpness. It’s luxurious and elegant. It has a high-end hotel feel,” she says. Perhaps at the top of the list of dramatic moves was the use of a mural in the dining room. Featured on a black panelled wall is part of a reproduction of Dutch painter Johannes Vermeer’s classic work, the “Girl with a Pearl Earring,” which dates to 1665 and is considered one of his masterpieces. The crazing of the work, its size and its character dominates the wall and, in fact, the room. The contemporary look is all in keeping with Tryaskina’s black and white theme. The effect is singular. 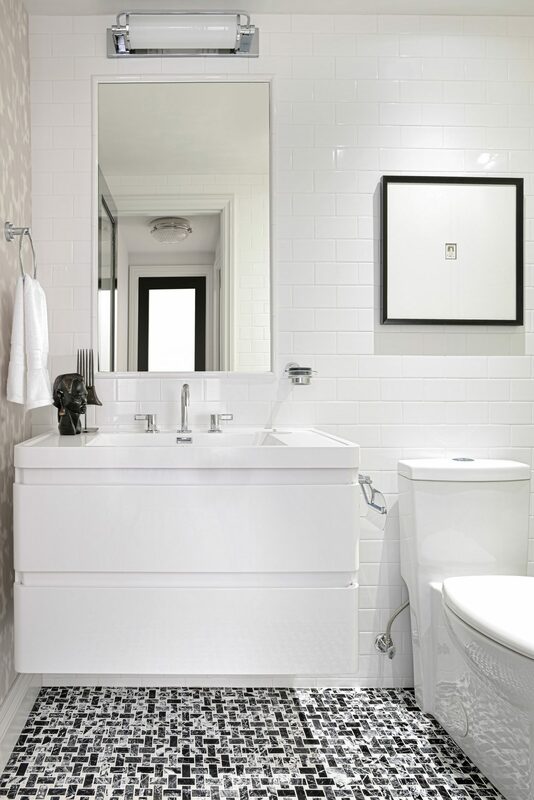 The designer used the same wallpaper in the master bedroom and the ensuite bathroom to create a sense of continuity. The designer says she had to play with selecting only a portion of the painting, to see how it would be displayed on the wall. 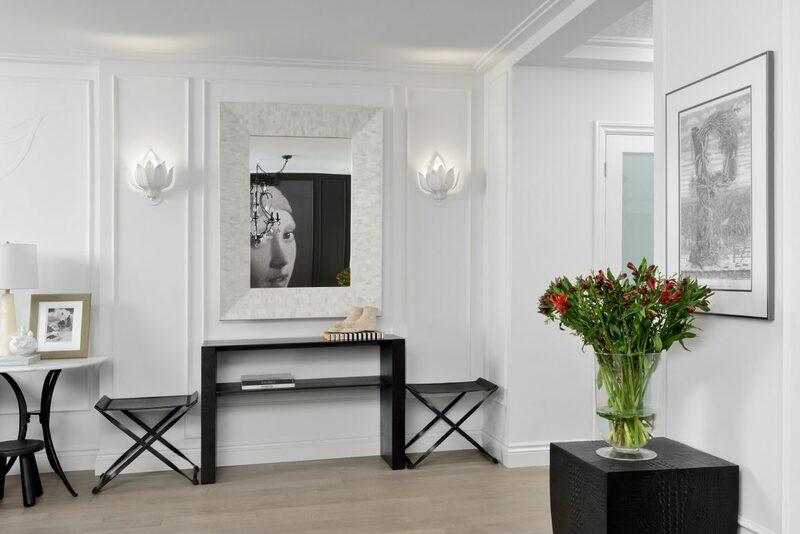 Another unique feature, albeit more subtle, which offers another dimension of surprise, is found in the living room, where this time a white wall is given a special artistic three-dimensional treatment. Tryaskina applied a sculptural application to the wall. Here she drew Japanese-style branches diagonally across the panelled sections of the wall, with the image stretching from one panel to the next. She then had artist Anthony Valin of Rustik Design apply plaster to the drawing, tracing the details of the sketch. In a studio, he created plaster flowers that were added to the branches. When completed, the entire wall was painted. “I asked that it be very, very low relief, very close to the wall,” she says. “And then he sprayed it with the same colour as the wall. It was white on white, the effect creating subtle shadows. He created such a beautiful piece of art. I had worked with Anthony on a previous project, and after that experience, I wanted to use his talent again. 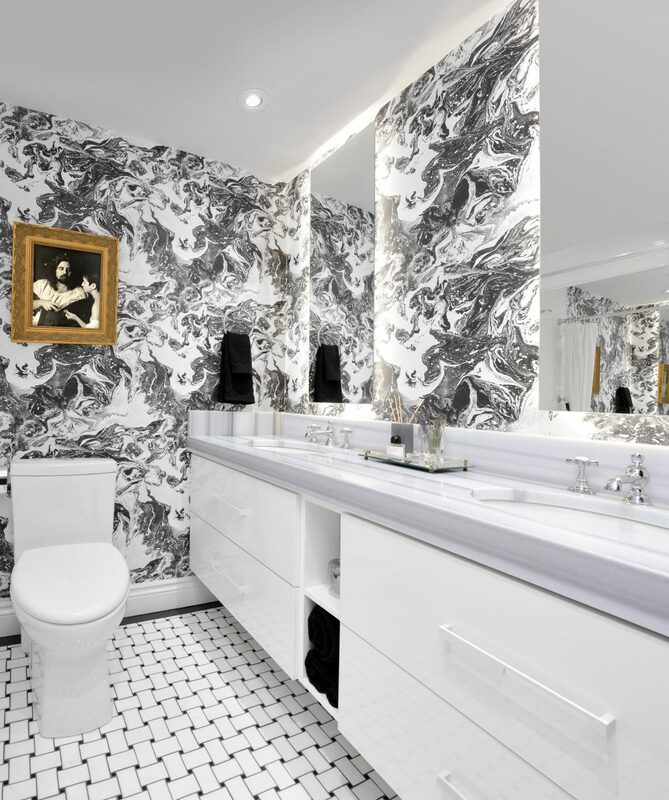 The black and white theme dominates the bathrooms and master bedroom, where the same wallpaper dials up the drama. Black-and-white wallpaper on a feature wall in the master bedroom draws the eye and sets the tone. 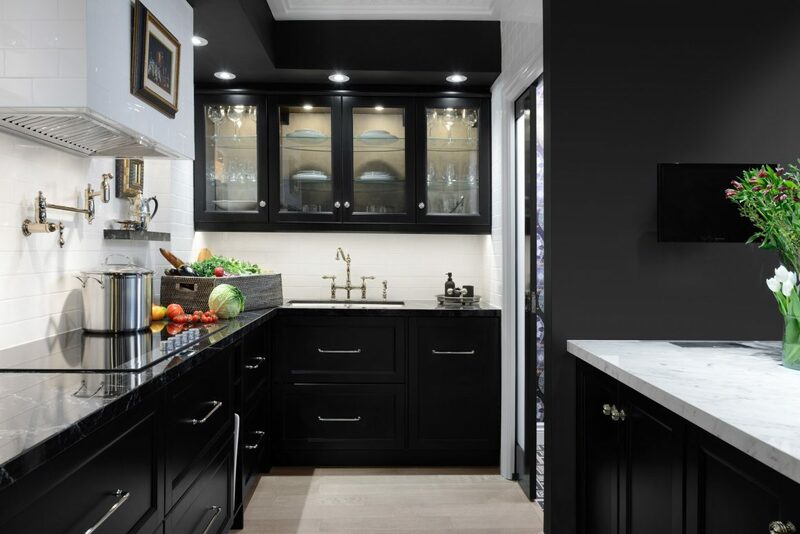 In the kitchen, the black and white theme is perhaps the most dominant, where the black ceilings with white cutout sections and black cabinetry set the tone. 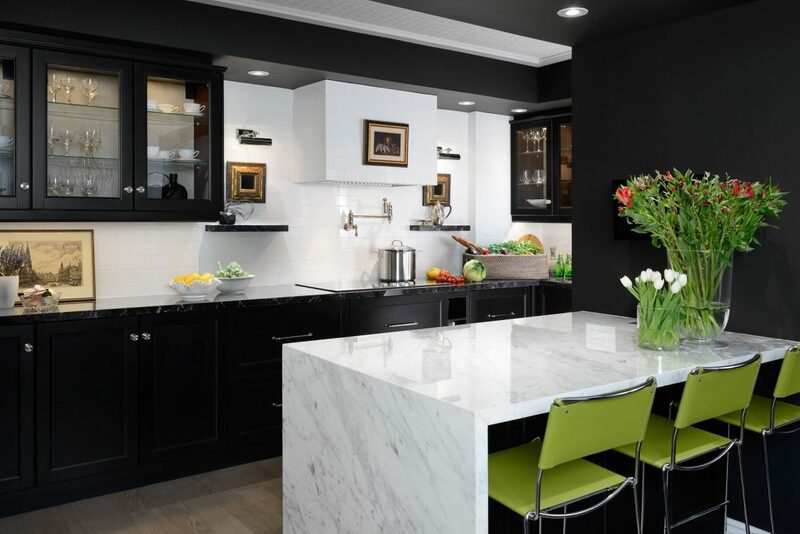 Along the wall, black countertops play off the white subway-tile backsplash, while the white surface of the island further adds to the contrast. 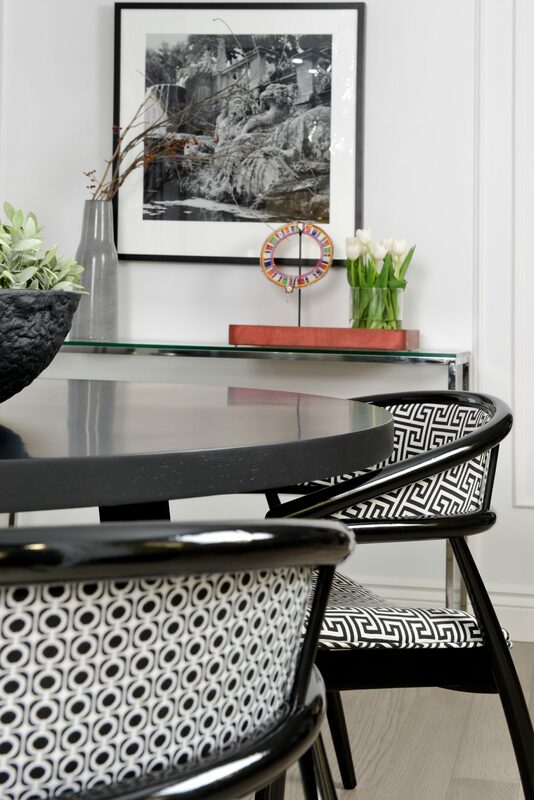 And throughout, artwork adds a touch of classic sophistication in an unexpected setting. Framed pieces are found on the range hood and under the upper cabinets. Art is elegantly displayed on the black-and-white backdrop that dominates the kitchen, where the ceilings were lowered to add to the drama. In fact, ceilings were dropped in some areas of the condo to accommodate a new lighting plan, and raised where possible. And then she had to walk away, leave the home she had designed for herself.